Inveraray - A review of the George Hotel Inveraray, together with my top tips for things to see and do on your visit to the pretty Aygyll town. Ten years ago today, I met Mr G at a Christmas night out in Edinburgh. It was love at first sight – thankfully, for both of us! 6 months later, we decided to have our first mini-break together. Having seen more of Scotland I was tasked with finding us somewhere to stay. After humming and hawing I chose Inveraray, a town I’d visited briefly years earlier. Mr G was doubtful. “What is there to do in Inveraray?” he asked. It turned out there were lots of things to do in Inveraray. And so began our love affair with the pretty, Argyll town we dubbed ‘our place’. Never ones to let the arrival of winter curtail our wandering, we set off on Saturday morning for an overnight stay at The George Hotel, our ‘our place’ accommodation of choice. It felt fabulously decadent to be sneaking a night away so close to Christmas. Being smugly organised, we had no need to join the hoards of stressed-out Christmas shoppers. Yay us! The roads were lovely and quiet, and as we wound our way along the shore of Loch Lomond the countryside transformed into a winter wonderland. It was frosty, bright and dry – perfect. Distracted by reflections in Arrochar! “REFLECTION” I shouted as we were passing through the village of Arrochar. The snow-covered mountains of the Arrochar Alps were reflecting on an icy Loch Long. We stopped, and slid our way along a frozen pavement for a better look. The snow-capped profile of The Cobbler looked stunning against a backdrop of blue sky. The Wee White Dug began to rub his face excitedly in frozen seaweed. The boy has a real passion for snow and ice. It wasn’t long before we stopped again. This time to admire the scenery at Rest and be Thankful – one of our favourite Scottish viewpoints. Gazing along the glen in the direction we’d just travelled, we watched the pale winter sun casting a sunset like glow on the horizon. The boy didn’t have time to waste admiring scenery. Finding himself outside with snow on the ground he began to tremble with excitement. I tried to take a couple of photos of him, coaxing with treats, silly voices, singing, arm waving, raspberry blowing – I exhausted my full repertoire to get his attention but nada. Nothing was going to distract him from the snow. Admitting defeat we indulged him with a snowy walk. It filled my heart with joy to watch the boy ploughing head first into the snow and rolling around, in his element. I share the boy’s passion for snow. I find it incredibly calming and peaceful to walk in, so I was equally delighted to find myself surrounded by the white stuff once more. Some of my favourite hikes have been winter ones. You’ll never find me cooped up indoors in my free time if I can avoid it. After a good roll around (the boy), and the satisfying crunch of a walk with snow underfoot (the humans), we made our way to a welcome oasis amidst the snowy landscape. A take-away food van, which can often be found sitting at Rest and be Thankful. With coffees in hand it was time to complete the final stretch of our journey to Inveraray. Before crossing the Aray Bridge into town there was time for one last photo stop. Hello Inveraray my old friend. Despite losing count of the times we’ve visited over the years, I always feel a buzz of excitement when I see Inveraray’s familiar skyline in the distance. In town, we snapped the obligatory photos of Para Handy’s puffer the Vital Spark. Para Hardy is a fictional character created by local author Neil Munro. Munro’s humorous tales of Para Handy’s adventures on the Vital Spark have delighted readers for many years. The puffer is the perfect tribute to the town’s famous son. I can’t remember ever seeing Loch Fyne reflecting quite as beautiful as it did that cold December morning. We stood, transfixed by the view. One of the most popular things to do in Inveraray is visit Inveraray Jail. As it was too early for lunch we decided to pay the jail a visit. 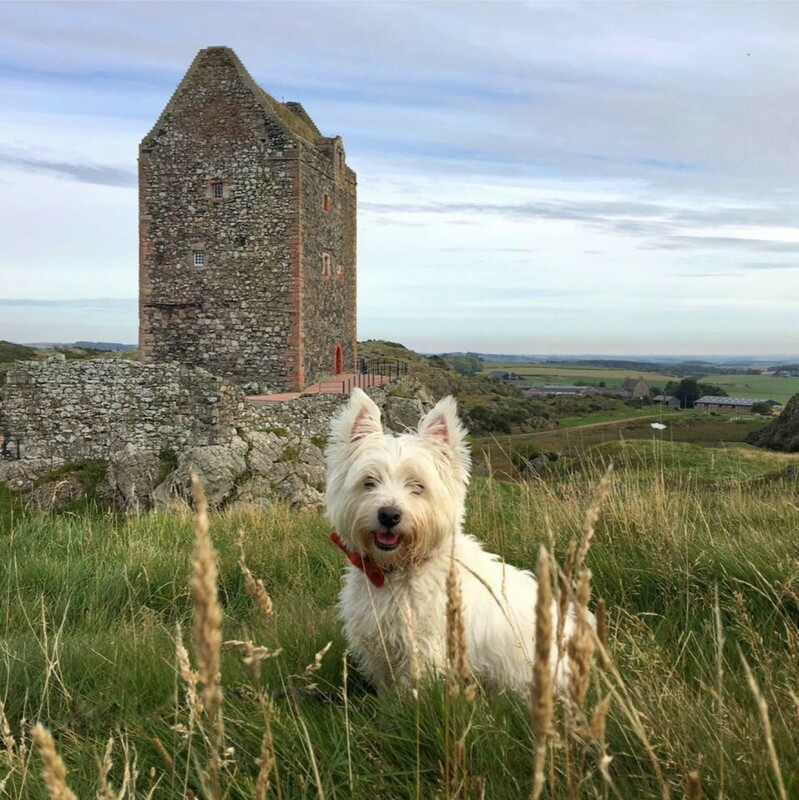 The old jail which documents the history of crime and punishment in the region, is one of my favourite visitor attractions in Scotland – it’s dog friendly too. The boy loves the place and excitedly drags us around at breakneck speed. That’s his favourite exhibit above. He’s not quite sure how the dog manages to stay so still, but he continues to greet it with a wag of the tail and a hopeful “do you fancy a game?” expression! If he has enough time, he’ll sit and listen to some cases in the courtroom when he visits! These were times when it definitely didn’t pay to get on the wrong side of the law. Punishments were harsh, and conditions inside the jail, far from luxurious. There were sad tales too – of young children, the poor and the mentally ill being locked up in prison cells. The Wee White Dug threw himself into the historic jail experience with gusto, but decided that prison life wasn’t for him. He’s ruled by his stomach and I suspect he thought that edible porridge was involved in ‘doing porridge’. He left sorely disappointed if that was the case! Next, another Inveraray favourite of ours – lunch at Brambles of Inveraray. As connoisseurs of homemade soup and sandwiches Brambles is the perfect lunch spot for us. The boy snoozed under the table, exhausted after his brush with prison life. One tasty tattie and leek soup, ham and mustard sandwich and chilled Irn-Bru later and we were good to go. We have a lot of Scottish favourites in Inveraray. Hotel, visitor attraction, cafe – so you won’t be surprised to learn that we have a favourite shop there too. Every trip involves a visit to Inveraray’s retro sweetie shop, Sweet Memories. It’s an Aladdin’s cave of childhood sweeties and memories. A visit always results in cries of “look, remember them?”. We left, stocked up on Chelsea whoppers, sweetie tobacco and fruit salad chews. We popped into Purdie’s of Argyll next. Their soaps and candles are hard to resist. Resistance was futile, and I left clutching a bag. No Pre-Christmas visit to Inveraray would be complete without a visit to the treasure trove that is The Christmas Dove. I bought a Scottish themed bauble for our tree and the best find EVER (but more about that later). En route to scout out somewhere to walk we ended up in the Inveraray Woollen Mill. I’d been tipped-off that Santa would be bringing Mr G a Harris Tweed waistcoat! Santa wasn’t entirely sure what size to get Mr G. 30 minutes later we left the incredibly dog and people friendly shop. Me, aka Santa with a bag containing a natty Harris Tweed waistcoat, and Mr G promising that he’d act surprised on Christmas morning. A visit to Inveraray Castle is another popular thing to do in Inveraray. It’s Clan Campbell HQ and home to the Duke and Duchess of Argyll. There are some great walking trails in the castle ground, including a hike to the summit of Dun na Cuaiche which offers spectacular views of Loch Fyne. The grounds looked stunning, cloaked in a white, winter coat. As we walked, the fading afternoon sun cast an orange glow over the landscape, making the snow glisten and shimmer. It was magical. All our pottering around soon banked us 11,000 steps, so it was time for the highlight of our trip. Check-in at The George, Inveraray – yippee. The first thing that hits you when you set foot inside The George, Inveraray is the welcoming atmosphere, and the warmth emanating from roaring log fires. The restaurant and bar areas on the ground floor are a rabbit-warren of cosy nooks and crannies. It’s the perfect place to linger over good food, good whisky and good music. The George offers all of these things in abundance, and it’s what draws visitors back to this much-loved Inveraray institution, time and time again. Our Deluxe Master room had a four-poster bed and spa bath – we LOVED it. It was tastefully decorated in keeping with the age and character of the beautiful old Georgian building. We had a fab view of the summit of Dun na Cuaiche too. The clock struck wine, so we quickly unpacked, freshened up and headed downstairs for some liquid refreshments! Scotland’s best bar is in Inveraray! Soaking up the amazing atmosphere in the bar at The George is top of our favourite things to do in Inveraray. Soon, we were sitting by a roaring fire with wine and beer in hand – bliss. It was now time to share the magic I’d discovered in the town’s Christmas shop with Mr G. Cardboard glasses that transform ordinary fairy lights into snowmen! Probably, the best invention EVER. After a couple of drinks we headed back to our room to relax for a while before dinner. The boy got into his swanky, tartan robe for chill time. Nothing says dandy quite like a wee dug in a smoking jacket! Later, refreshed and spruced up we headed downstairs for dinner. We were seated beside another roaring fire and I knew we’d get no complaints from the boy. He’s a big fan of a toasty tummy. As we were celebrating 10 years together we decided to treat ourselves to a nice bottle of fizz. I’ve never received bad service or a had a poor meal at The George, and that evening was no different. Even though the place was packed to the rafters, the service and food were excellent. We both started with a smoked cheddar, spinach and mushroom quiche. Mr G hates quiche, but not at The George apparently. He waxed lyrical about his hake main course, and I enjoyed spaghetti Bolognese – a dish I’d never normally order in a restaurant, but The George serves a mean Bolognese. We were fit to burst, and the champagne bubbles were starting to take effect but we soldiered on and ordered dessert. Mr G hoovered his sticky toffee pudding in seconds. My French chocolate cake with pistachio ice cream didn’t last long either. It was superb, and just the right level of stick to your teeth gooey. I paint a beautiful picture, I know! The bar was hooching when we threw in the towel shortly after 9pm to retire to our room with a couple of cocktails. Did we just get old? For the first time ever, we’d left the best bar in Scotland when the night was still young. Flushed from good food, fire and wine I opened a window to let some cold night air into our room. The boy slumped on a rug by the fireplace and was soon out like a light. Mr G and I reclined on our four-poster bed like sultans. We drank our cocktails and listened, as the sound of the band playing in the bar below wafted up, and in through our open window. They were really good, and although we weren’t downstairs ‘geein’ it laldy’ we still had a great night. After a fab sleep, we were up early and ready for breakfast by 8:30am the next morning. It was like a ghost town downstairs. Clearly our fellow guests were going to need slightly longer to recover after spending an evening revelling in the bar! Mr G picked his favourite smoked salmon and scrambled eggs for breakfast, and I had a humongous, full Scottish. It was really tasty, and my egg yolks were cooked to perfection for dipping. Outside the clear, blue skies of the day before were gone. It was dark, murky and the rain was lashing down. We didn’t care though, we’d just enjoyed another fabulous visit to ‘our place’. I’d like to thank the George Hotel for very kindly hosting our stay. Although we were invited to stay on a complimentary dinner, bed and breakfast basis, the opinions contained within this blog are entirely my own. I love Inverary and especially Loch Fyne Whiskies! It may have something to do with having MacLachlan ancestry. The last time I was there I believe it was the “Artic Penguin” that was at the quay. Why, yes, it has been a while. Anyway, great job on this one! Thank you. It’s a charming little town that has all you could need – good food, good whisky and beautiful scenery. Absolutely gorgeous town – our favourite place too! We’ve had lunch at the George, though as yet have never stayed overnight but your experience sounded lush so we’ll need to look into it further, particularly if they allow dogs as we have a mischievous lhasa who also loves a jaunt around Scotland. Thank you, so glad you enjoyed the blog. Definitely recommend an overnight stay at The George with your four-legged friend. It’s a brilliant hotel and one we never get tired of. This is such a great post. Love all your photos. And your sweet pup…oh my goodness. What a cutie! Aww you too Dawn-Marie – I hope you and the family have a lovely Christmas and New Year, and here’s to lots of new Scottish adventures in 2018. You guys will love Inveraray so I’d definitely recommend a visit soon. Another place on our list to stay and explore a bit more. We stopped here for a leg stretch and lunch whilst enroute to Machrihanish last year. Such a pretty place. Looks like you got some cracking reflections on the loch too. Thanks Mel – you guys will absolutely love Inveraray. Lots to see and do, and it’s a great base for exploring Argyll. Marvelous as always! Congratulations on 10 joyful years! Thanks for taking us along with The Wee White Dug. Glad all of y’all love snow….I’m waiting until it warms up to travel around. Absolutely breath taking. Your pictures and description demand that one must visit. I loved it! Really enjoyed your blog. Especially seeing your wee white dug! Some gorgeous photos of Inveraray and of your gorgeous Westie! We stopped in Inveraray this past summer. We had visited the castle and stepped into the George for a pint or two. Had lunch in the restaurant as you enter the town, cannot remember it’s name. Your photos sure brought back memories. Sounds like a fun trip. It’s such a lovely town. There’s so much more I could have shared too, so I think I’ll be back with more from Inveraray. I think you may have eaten at Samphire?